UPDATE: Sony brings BBC Sport app to Entertainment Network | What Hi-Fi? Sony has today (June 20th) launched the BBC Sport app on selected Bravia smart TVs. The BBC Sport app sits alongside the BBC News and BBC iPlayer apps on the Sony Entertainment Network. The Sport app is available on all sizes of Sony KDL-EX553, EX653, HX753 and HX853 models. Further details in our story below. 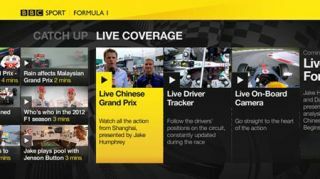 Sony has clinched a deal with the BBC to bring the BBC Sport app to Sony's Entertainment Network, available on 2011 and 2012 connected Bravia TVs and the PS3. The firm believes this is one of the "killer apps" for 2012 and it will be made available in time for Wimbledon and the Olympics this summer. Viewers will be able to enjoy live streams of BBC coverage of key sporting events including Formula One and Wimbledon, followed by 24 simultaneous streams during the Olympics, all in high definition. The app has been designed specifically for big-screen TVs, and will offer both live and on-demand content from the UK and around the world. Edd Uzzell, Sony category development manager for Bravia, says: "Televised sport is one of the biggest ratings wins fro broadcasters. This truly is a killer app and will provide a substantial amount of additional sporting content that you can't get through current broadcasts." You can read more about the BBC Sport app here.